Well, this is a super exciting kind of post. Hella Handmade Creations (pka Hella Holo Customs) has changed their format starting this month April 2018! Multiple makers will be participating each month with one nail polish and there will be an open window for purchases. I have more details later on in the post and lots of swatches of Girly Bits Cosmetics' creation for April! 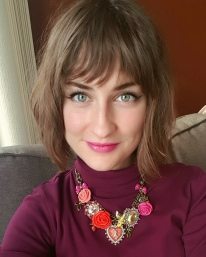 For the new Hella Handmade Creations format, each maker picks a theme/series that they will follow for the next few months. Pam of Girly Bits has signed on to do a series for HHC inspired by Harry Potter. The launch for the new format will be April 14th at 12:01 AM EST and the shopping window is 7 days, ending on April 21st at 11:59PM Hawaii time. The will be a pre-order each month and the expected TAT is 3-4 weeks after the shop closes for the month. 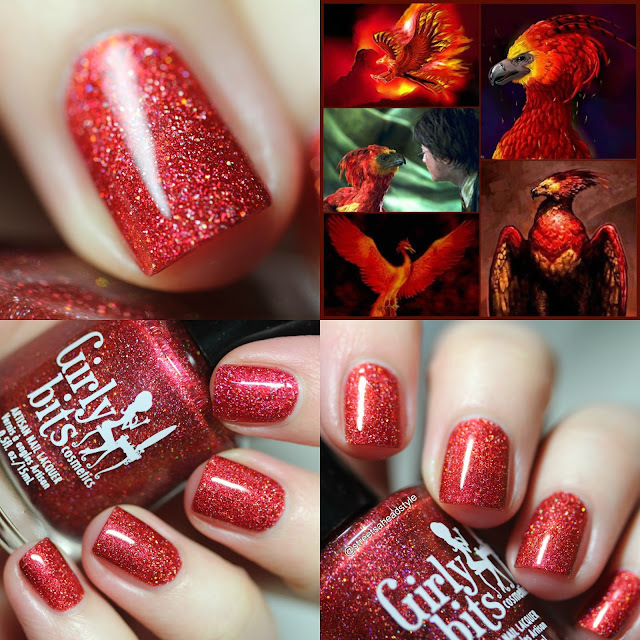 The first polish in the Girly Bits Hella Handmade Creations series is No Fawkes Given and it is inspired by Fawkes, the phoenix who was Dumbledore’s animal companion. Girly Bits Cosmetics No Fawkes Given (15mL, $13 USD) is a bright red scattered holo with a golden/copper shimmer, and a slight sprinkling of gold holo microglitter. This polish is 5 free, cruelty free, and vegan friendly. I think No Fawkes Given just kicked It Was the Fireball out of the top spot for favorite Girly Bits red... and Girly Bits knows how to make a mean red! (Another awesome red is Walk On the Wild Side). What really stands out about No Fawkes Given is the smoothness of the formula and finish along with the shimmer. It's absolutely glowing! This is so packed with holo and shimmer but it's smooth as butter. Two coats and top coat for these photos. Seriously one of the most gorgeous reds ever! You're going to need this one.